Editorial Summary: AYM volunteers appreciated my contributions and as a token of their gratitude, they used to offer me cornflour paste. The volunteers contributed money which they used to cook food. Most times, I felt sad observing severe poverty and everyday struggle as my friends struggle for food and basic necessities of life. AYM Volunteers were helping the community to stop cutting trees by educating the local people about the importance of trees in the ecosystem ———— Sharad Pant. 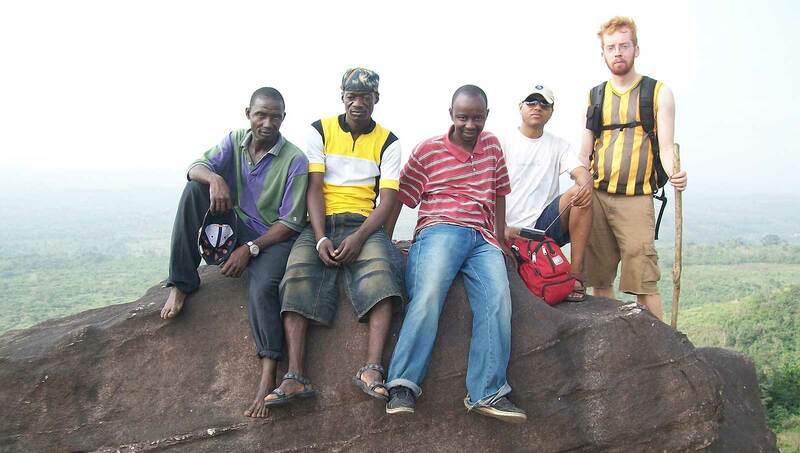 I was a VSO Volunteer in Sierra Leone for one year, 2010-11 and, I was based in Mattru Jong! Mattru Jong is a growing town situated on the bank of the Jong river. One Sunday morning, I saw a Building with a display board that said 21st Century African Youth Movement. Out of curiosity, I went inside. Some young people came forward to greet me and warmly informed me about the AYM and its work. I was happy to meet some like-minded friends other than office friends. The next morning, a tall young man who had met me in AYM office joined me at the field where I was busy practicing my Martial Arts. He had shown interest to learn martial arts. I let him know that martial art is not a simple game. I said, “you must work hard with regular practice.” I invited him to join me the next morning at 5 am. The young man used to come regularly for practice. His name is Sylvester. He said he likes to play Chess. I said “good, so now I will call you Chess, it is a very short and sweet name.” He liked it. Thus, Chess became part of my day-to-day life. He introduced me to other AYM volunteers like Umaru and Idris. 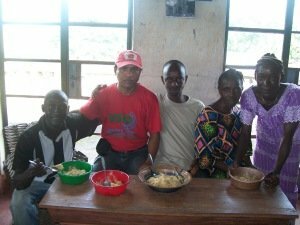 After the friendship with those volunteering in Sierra Leone, I never felt alone in Mattru anymore. 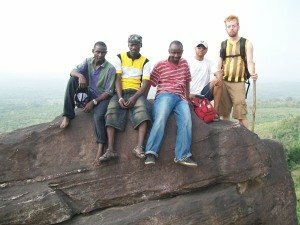 With my AYM friends, we planned every imaginable expedition, sometimes, to Moselleh Beach and, sometimes going mountain climbing. We used to cook food on these expeditions, sleep under the open sky, or, spend our whole day on the River Jong. AYM and the expeditions have remained memorable moments of my stay in Mattru Jong. On the request of Umaru, I started sharing my knowledge with AYM volunteers on Sundays. Various subjects, such as teamwork, Ecotourism, motivation, time management, business planning and management were discussed. AYM volunteers appreciated my contributions and as a token of their gratitude, they used to offer me cornflour paste. It was very delicious. We used to eat it together. Even though I told them not to offer me any food, because I was very well aware that they don’t have money to buy cornflower, they were adamant to share the little that they had. The volunteers contributed money which they used to cook food. Most times, I felt sad observing severe poverty and everyday struggle as my friends struggle for food and basic necessities of life. But the best and most encouraging thing in all the odds they faced was, their courage and hope. I never observed them being nervous. They never blamed God or anyone for their situation. The volunteers were always hopeful and confident to find a way to live and look forward to a better and promising future. The volunteers really inspired me with their never-give-up attitude. Even today, whenever I get frustrated with any situation, I just remember the faces of my AYM friends – Umaru, Chess (Old Meh), Idris and so on… I remember their smiling faces and get energized, filled with positive energy. AYM volunteers used to talk about Dennis, his teachings and remarkable work in the community. I was curious to meet Dennis. The day came and at last I met with Dennis. I understood why the volunteers remember him so much. Whenever Dennis comes to Mattru Jong, there was renewed energy among the AYM Volunteers. Dennis introduced the solar energy system and AYM volunteers started a mobile phone charging venture. The solar power and the mobile phone charging business created new livelihood and opportunities for AYM volunteers. AYM volunteers were also working on Ecotourism. 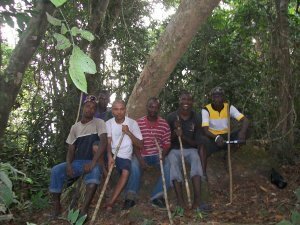 They were helping the community to stop cutting trees by educating the local people about the importance of trees in the ecosystem. I observed that Umaru, Chess, Idris, and others have a lot of ideas. They want to provide good roads, electricity, tap water, toilets and health services to their community. 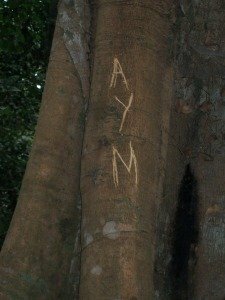 The volunteers for AYM have zeal to do lots of development for their motherland, Sierra Leone, but their lack of technology and financial resources are their main hurdles. Though a lot of hurdles exist, the volunteers have hope and trust that they will come out like Diamonds from black coal.